Compatible Versions Designer and Photo? The compatible versions haven’t been released yet. (1.7) They’ll come later in the beta. That makes sense. And that is my question answered. With the number of times this question shows up, I would suggest this could be a pinned thread in the forum. Agreed, this should be a pinned thread. 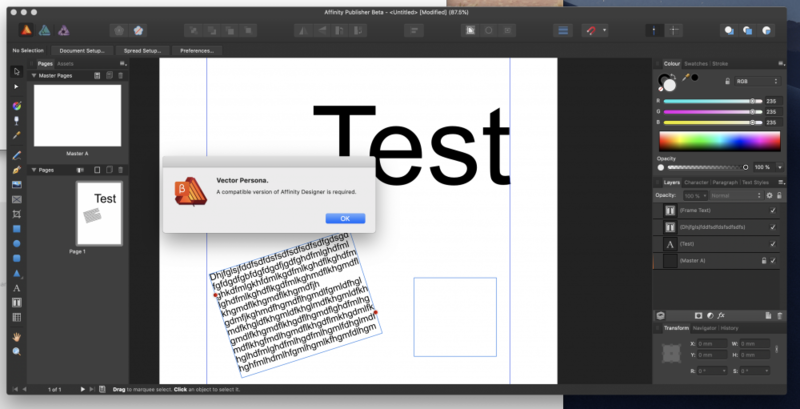 Obviously this will be a much used and appreciated feature once Affinity Publisher is released. Out of curiosity (and anticipation), is there a rough estimate on how long it is expected to be before those betas are out - very rough, like this year yet, within the next 12 months, ...? Reading designer file in Publisher results in some broken text, missing margins and guides. Is this known issue and would be targeted eventually in feature betas? Is that related to older file format? This isn't a known issue. Please make a new thread and supply your Affinity Designer file that shows this fault. Done. New thread here . yeah I was wondering also what was the issue. thanks for the update! Attached is a screenshot to show the whole issue. Sorry, just catching up here. On October 2nd Patrick Connor wrote "When we start the 1.7 Mac and Windows customer betas of Affinity Designer and Affinity Photo these buttons should enable. In the purchased version of Affinity Publisher these buttons will only enable (independently) with a purchased version of Affinity Photo and/or Affinity Designer of 1.7 or above"
Perhaps I'm not reading that properly but does it mean that those of us who purchased early versions of Affinity Photo and Designer will not get a free update to v 1.7 enabling those buttons? I seem to remember that we were promised free updates for two years but honestly cannot remember when that ran from. Was it the time we purchased, or the initial introduction of the alpha programmes? Let me stress I think they are all amazing value, especially with the fantastic support Affinity provides, and will be quite happy to purchase updates . Just would like clarification. All users who have purchased Affinity Designer/Photo will have the respective buttons available in Publisher when released. So if you bought both apps (Designer & Photo) you will be able to access/use both buttons. If you only purchased one of them you will only be able to access the respective app you bought. This feature will be available from version 1.7 and above - which means you will have to update your existing apps (Designer & Photo) to v1.7 (for free as promised) to be able to use them with Publisher (when released). My initial information above was incorrect, sorry. We have decided not to enable the additional personas in the Affinity Publisher free beta with the customer beta builds of the other desktop applications (ADe & APh), so my earlier post is now misleading. However the (free update) 1.7 release builds of Affinity Designer and Affinity Photo will enable the equivalent Affinity Publisher personas. @meb should Publisher's "vector" and "photo" personas be working with the latest 1.7.x betas of Designer and Photo at this time? No. Only the final Photo and Designer 1.7 versions will work with Publisher personas buttons. This means that publisher will have access to all features in Photo Persona but not to Liquify and other Personas. Correct? The other personas are simply not active at the moment, but they will not have the full functionality of the other applications and their additional persona, no. Will there be "Edit in Designer…" and "Edit in Photo…" menu items in the released version of Publisher? They exist in the current beta version, and I would expect them to remain in the released version, but only time will tell.